The Caravan website management wish to thank Mark Walker for spending time to answer our questions. We have posted the interview for your viewing below. Hi Mark firstly can you tell us how you came to join Caravan? Well I had a call from an old friend Martin Davenport who said the band were going to be filming a live show for the ITV Legends series but that really sadly Richard was no longer able to play drums for a whole gig. He asked whether I’d be interested in helping out doing some percussion and double drumming with Richard and being a fan of course I jumped at the chance. But even more sadly when we came to rehearse Richard wasn’t able to play drums at all so we swapped roles from the original plan with me playing kit and Richard doing percussion. What were the rehearsals like? Nerve racking but a lot easier than I anticipated Richard and the band were very open and really welcoming to me but there weren’t enough rehearsals! We got together for a couple of days in October and the plan was to then do 3 days before the Legends show at Metropolis. But the weather was a nightmare and in the end because of the snow we only had half a day so we did a couple of run-throughs learned a couple of new songs and flew by the seat of our pants at the gig! Amazing what sheer terror and clenched buttocks can bring out of you! Plus of course Pye Geoffrey Jim and Jan kept giving me cues and it was great having Richard next to me playing percussion – very reassuring! Absolutely! I don’t want to sound sycophantic or cheesy but Richard is a fantastic drummer his feel and drum parts are integral to the Caravan sound and I used to play along to the albums when I was younger so it felt a real privilege and honour to be up there next to him playing his rhythms and I just wanted to say something. Although I’m absolutely thrilled to be drumming for Caravan now but it’s so sad that he can no longer play. What was your favourite song on the night? I love the groove on Headloss right up my street and Smoking Gun is a personal favourite but I have to say counting in Nine Feet Underground and going into that was a real moment for me – took me back to school days playing along to it in the attic at home where I kept my drum kit I had a real feeling of elation and got a tear in my eye as Jan was soloing away! I was really pleased with them I actually got them for the gig from Dixon whose drums I’ve played for a long time along with Zildjian cymbals. Without wishing to be too technical the shells are shallower and the bass drum slightly smaller than my usual kit and the wood Dixon use for the drums and way they make them gives a beautiful warm sound that has a punch but as you say blends really well with the band and in particular Jim’s bass. That’s an example of how open the guys are. When we rehearsed it I jokingly mentioned I played washboard when Geoffrey got his spoons out and Pye said let’s hear it. Geoffrey was immediately up for the idea of a washboard and spoons duet sounds bizarre but it worked! How long have you been playing drums? 43 years which oddly enough is about how long Caravan have been going! Well not really. I’d like to be able to say that I heard Caravan and took up the instrument but the truth is I was only 6 at the time I started on a pair of bongos and was living in Australia about as far as you can get from Canterbury and definitely not mature enough to be listening to such advanced music! So who were your drumming heroes? Apart from Richard Coughlan!? Well originally Mick Tucker from The Sweet and Don Powell from Slade but then I progressed to the usual people rock drummers site as influences; Ian Paice was my first real hero I loved Phil Collins Neil Peart Bill Bruford Alan White from Yes Dennis Davis from Bowie’s band and later John Bonham who I really only got into after he’d died so never saw him live. And then some of the great session guys like Steve Gadd Jim Keltner and Kenny Aronoff. Plus Billy Ficca from the American band Television – genius! And I saw Buddy Rich twice – absolutely unbelievable! You’ve been playing for Rolf Harris for the last 15 years what’s that like? Amazing. The great thing with Rolf is he is so unique and so loved that you do some fantastic gigs – I’ve played at Glastonbury with him 5 times he opened the main stage for the 40th anniversary in 2010 and they reckon there were 70 000 people in the crowd – incredible human beings as far as the eye could see! And from a personal point of view it opened up a whole new musical world for me when I joined him as I play percussion rather than drums – congas shakers washboard sticks loads of sound effects. These days we don’t do many gigs but he’s still going strong even though he’s 81. So what about the future with Caravan…? This entry was posted in Interviews and tagged Mark Walker on May 11, 2011 by caravan. Great interview I’m amazed Mark is 49 (unless my maths is getting rusty). He’s still the baby of the band I wissh Richard all the very best and hope he is still getting plenty of enjoyment out of life the Legends recording at the Metropolis Studios was very special for me I hope to catch you guys on the road later this year any more gigs lined up apart rom those already advertised? Thanks for your comments. The band are playing at the End of Summer Festival in Lyndney Glos on the 9th October . They are hoping to play at the Shepherds Bush Empire on the 8th October . Dates are also confirmed for the 15th in Edinburgh and the 19th at Canterbury . 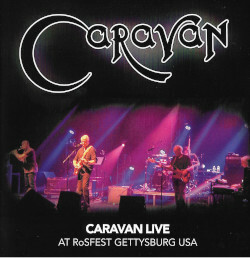 Another fan of Caravan playing for Caravan now. How great is that. Hope to see them play Dublin again. So sorry to hear of Richard’s disability: what an injustice to such a great and talented sticksman. Still very best wishes to Mark whose arrival I hope will galvanize a new era of creativity and sublimity for my all-time favourite band. Rock on guys – and I look forward to catching you in concert this year. Any news on Shepherds Bush Empire on the 8th October Gig ?